This fun pumpkin patch adds a bit of country whimsy to your front porch. Made from scrap pieces of wood it is an inexpensive and simple way to add some fall decorations indoors or out. Using various textures creates a more interesting and visually appealing piece- wood, wire, and cork combine to make your pumpkin patch a cute and welcoming addition to your fall decor. 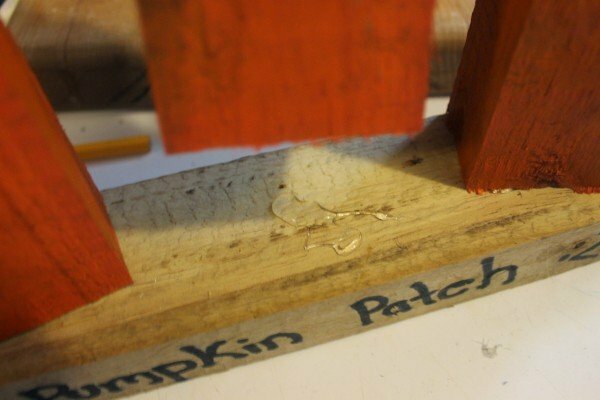 This Wooden Block Pumpkin Patch DIY is a fun way to repurpose some scrap pieces of lumber while making a fun and unique craft for your holiday decorations. Pumpkins are great not only for Halloween, but throughout the Fall season and into Thanksgiving! Grab the supplies needed, a bit of imagination and have fun making this great Upcycle Craft for your holiday decor! Cut your wood to varying sizes, I cut my pieces to 3″, 4″, and 4 1/2″. If you ask nicely they may cut them for you at the home improvement store, or may charge you just a bit per cut. Better yet they usually have a bin of free pieces that are leftover from other cuts- if you can grab a few of these even better. For the base I left it about 12″ long. 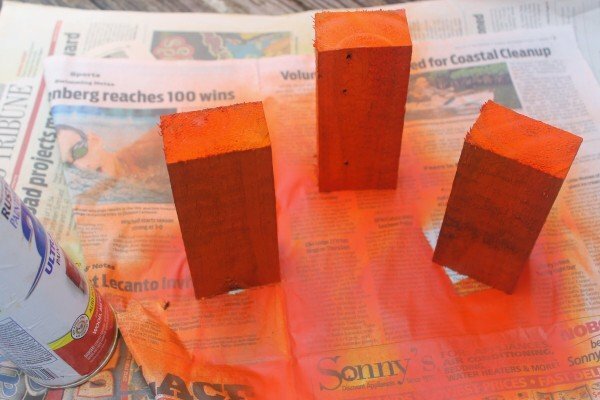 Set small wooden block pieces on newspaper in a well ventilated area, spray with a light coat of paint to create a nice tack coat. Allow to dry for 5 minutes before adding another 1-2 coats to your desired coverage. Dry after final coat for 2 hours. 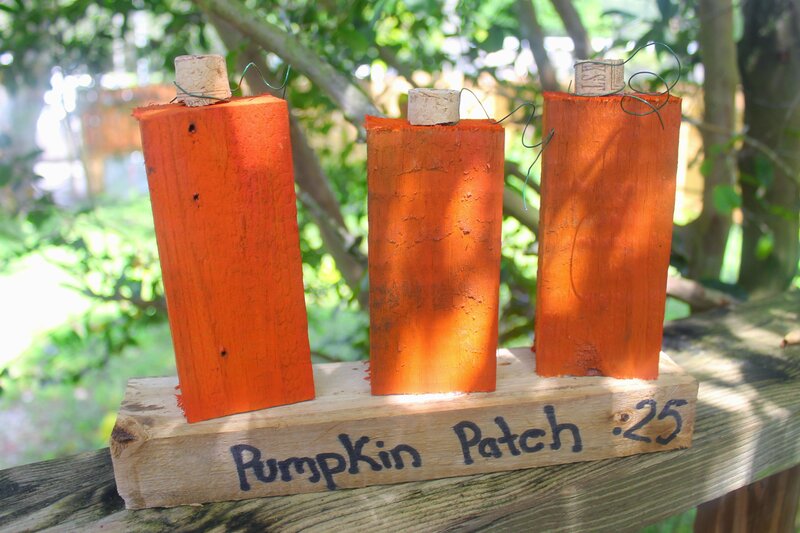 While blocks are drying, create your “Pumpkin Patch $.25” text using a black paint pen. 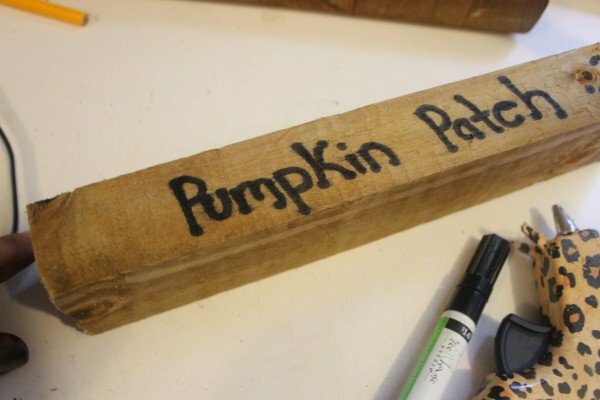 Write on the wood with a pencil first until you are happy with your wording, then go over it with paint pen. Allow to dry. Cut your corks in half, glue one to the top of each painted pumpkin. Cut 3- 6″-8″ lengths of green floral wire, wrap them around a pencil to create a curling vine. 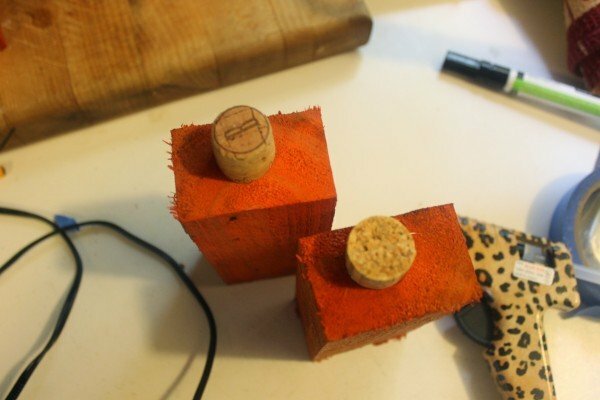 Wrap one end around your cork, secure with a dab of hot glue. Use a pencil to mark where you want your pumpkins to go on the base, apply a generous amount of glue and press your painted block on it. A high heat glue gun is best for adhering wood together. 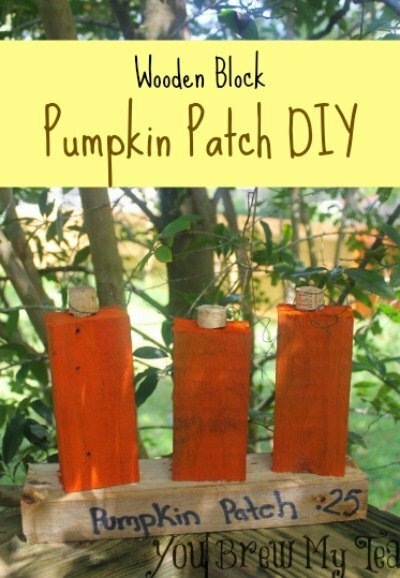 This is a great piece to make for upcoming craft fairs, to decorate your own home, or to give as a gift to a friend you know would love the unique Wooden Block Pumpkin Patch DIY project. Make sure to always be safe when handling equipment like saws to cut wooden pieces. Proper eyewear as well as keeping kids and animals out of the way is important, and don’t forget the mask and good ventilation when working with aerosol spray paints! You can alternately use a regular paint and do this by hand, but it would take more time and be a bit more awkward to do. We love how easy spray paint is for projects like this! You could even make them with various shades of orange, yellow, cream and maroon for a full Fall theme! Check out our other awesome Fall Themed DIY Crafts! So cute and simple. Love! Your pumpkin patch is adorable. Thank you for stopping by https://diyhshp.blogspot.com and linking it up to More the Merrier Monday. I can’t wait to see what you link up next Monday. I love that this pumpkin patch will last for years and years! Cute idea! Thank you for sharing it with us at the #HomeMattersParty this week.